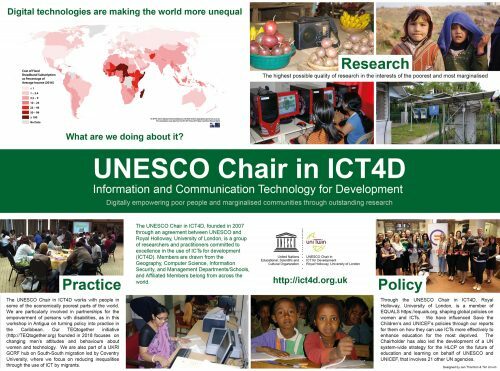 We are delighted to share this new poster prepared for the UNESCO Chair in ICT4D by Jen Thornton, highlighting the aims of our research and how these influence policy and practice. Especial thanks too to our friends Sanna Ojanperä and Mark Graham at the Oxford Internet Institute for preparing the map on the latest figures for the relative costs of fixed broadband subscriptions across the world. Put simply, we try to do the best possible quality of research with, and in the interests of, the poorest and most marginalised. For a high resolution .pdf version, please click here.